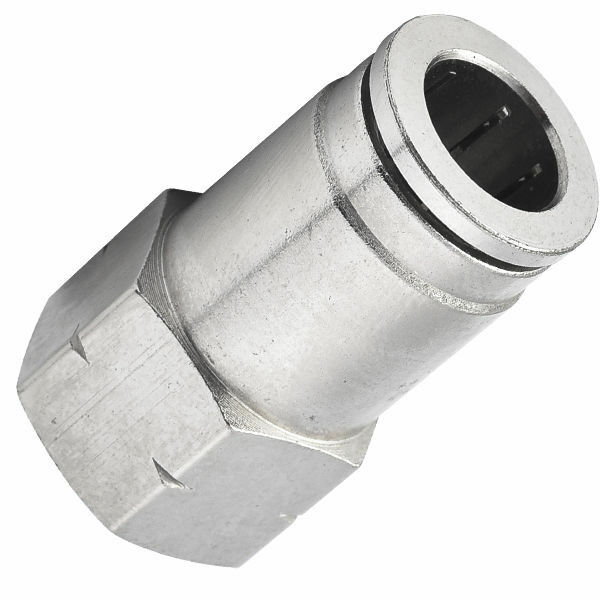 Female straight connector is a nickel plated brass push to connect fitting that connects a tube to a male threaded connection in a straight line. Brass push to connect fittings are an excellent alternative to those made of plastic materials. Brass push to connect tube fittings are designed for polyurethane or nylon tube; quick connect and quick release fittings (no tools required to connect and disconnect tube). Nickel plated brass push to connect fittings are recommended for compressed air, pneumatic, instrumentation, circuit, lubricant and cooling lines. To assemble, simply push the tube into fitting until it bottoms out.